Last year I wrote a couple of articles about statin therapy, so maybe you think I should give it a rest. However, I think it is such a hugely important issue, and I have this strong feeling that the truth really has not emerged yet. Firstly, two recent scientific papers touching on the effects of statins on cognitive function, glucose tolerance, skeletal muscle function and coenzyme Q10 really had me thinking a lot about how much we still don’t know about the long-term use of statins. Secondly, last month I happened to read a fantastic book about “the other side” of statin therapy written by an American cardiologist. A well written, thought-provoking, easy to read book that everyone interested in modern-day health care should read, not least doctors. Statins are used by about 25 percent of Americans 45 years and older. Between six and seven million people in the UK take statin drugs every day. But what are they used for? What disease or disorder in our society motivates drug therapy for such a large proportion of the population? In short, statins are prescribed by doctors to help protect healthy but high-risk people from heart disease and to prevent heart attacks and strokes in people who have already been diagnosed with cardiovascular disease. One has to wonder what gives medical professionals the right to prescribe therapy to such a huge number of people? Firstly, prove of efficacy must be substantial and there is really no room for any doubt. You would expect such therapy to significantly lessen the burden of disease and to prolong life. Secondly, it has to be absolutely proven that such treatment does not cause harm. If we trust regulatory authorities, we will have to assume this is not true for statin drugs. Overprescription of drugs is quite common today and represents a real problem and not just recreational use. Statins for Primary Prevention – Does the Benefit Outweigh the Risk? In 1987, statins were approved in the United States to lower cholesterol. Lovastatin (Mevacor) was the first statin approved by the FDA. At that time there was evidence that this drug lowered LDL-cholesterol but it had not been proven that doing so would reduce the risk of heart disease or improve survival. During the next 20 years, a number of large clinical trials addressed the clinical efficacy of statin therapy in healthy people with increased risk of heart disease (primary prevention) and in patients with documented cardiovascular disease (secondary prevention). Approximately 65 thousand patients were included in the primary prevention trials, 65 percent were men and 35 percent were women. Taken together, the all-cause mortality rate was 11.4 per one thousand person years among people on placebo and 10.7 per one thousand patient years on people on statins. This difference is not statistically significant. Furthermore, there was no relationship between the amount of reduction of LDL-cholesterol and all-cause mortality. So, shockingly some might say, the evidence that statin drugs prolong life among healthy people with increased risk of cardiovascular disease is non-existent. Several studies have addressed the efficacy of statin drugs compared with placebo among patients with a documented cardiovascular disease. The three largest trials, 4S (Scandinavian Simvastatin Survival Study), LIPID (Long-Term Intervention with Pravastatin in Ischemic Heart Disease study) and HPS (Heart Protection Study) showed that all-cause mortality was significantly lower among patients receiving statin therapy compared with placebo. The absolute reduction in all-cause mortality was 4 percent, 3.1 percent and 1.8 percent in the three trials respectively. So, if we focus on all-cause mortality, the conclusion is twofold. Firstly, statin therapy is effective and saves lives among patients with a documented cardiovascular disease such as prior heart attack or stroke. Some might say the effect is small, but it is consistent and cannot be ignored. Therefore, not giving statins to patients with documented atherosclerotic cardiovascular disease is bad clinical practice and goes against evidence-based medicine. Many will say it is malpractice. Secondly, however, it has not been proven that statin drugs reduce mortality among healthy people with increased risk of heart disease, except for individuals with diabetes and those with the relatively rare disorder of familial hypercholesterolemia. Thus, it is absolutely clear that we are treating a substantial proportion of the adult population with statin drugs, despite the fact that treatment has not been proven to reduce the risk of death. However, treatment is commonly motivated by study results showing that treatment will reduce the risk of cardiovascular events such as heart attacks and stroke. Among relatively low-risk individuals, it has been estimated that for every 1 mmol/L reduction in LDL-cholesterol there is an absolute reduction in major vascular events of about 11 per 1000 over 5 years. What does this really mean? Let’s say that I am a low-risk patient and my LDL-cholesterol is 143 mg/dl ( 3.7 mmol/L ). My doctor prescribes a statin and I decide that I will take it every day for the next five years. My LDL-C goes down to 104 mg/dl (2.7 mmol/L) while I’m taking the drug. This treatment is going to make it one percent less likely for me to have a coronary event or a stroke during those five years, compared to if I do not take the drug. Not very impressive indeed. One has to wonder whether this proposed benefit outweighs the risk of treatment. If there is doubt, we should not treat. Primum non nocere; first do no harm. The Other Side of Statin Therapy? The clinical studies comparing statins with placebo indicate that statins are remarkably safe drugs with few side effects, muscle ache being the most common. However, it is well-known that side effects ar less common among patients participating in clinical trials compared to “real life” patients. In most clinical trials involving statins, less than one percent of subjects are reported to develop muscle pain or myopathy. In clinical practice, however, far more will experience myopathy. The much lower rate reported in clinical trials may be because eligibility criteria usually exclude patients with significant potential for drug interactions or concurrent health problems, whereas healthcare providers obviously cannot exclude such patients in clinical practice. Some studies have suggested that a quarter or even up to a third of patients who take statins will sooner or later develop a clinically significant myopathy. Cases of rhabdomyolysis have been reported. This happens when muscle fibers die and release a protein called myoglobin into the bloodstream. High blood levels of this protein can lead to kidney failure. Although this is a rare disorder, it can be fatal. In october last year a study addressing the possible negative effects of statin therapy on cognitive function was published in the American Journal of Geriatric Pharmacotherapy. Statin therapy was withdrawn in eighteen older subjects with Alzheimer´s disease. After six weeks the patients were put back on statin therapy. MMSE (mini mental state examination) was used to assess cognitive function. This is a standardized mental status examination reflecting memory and simple thought processes. In short, cognitive function improved when the patients were taken off statins and worsened again when statin therapy was restarted. The authors conclude that statins may adversely affect cognitive function in patients with dementia. This is a small study and the results will have to be confirmed by more research. However, it is not the first study to show negative effects of statins on cognitive function. The next most common adverse effect reported by people taking statins, next to the muscle side effects, involve cognitive impairment. These are interference with the inability to think, concentrate, remember and solve mental problems. It has been suggested that this may have to to with the lowering effects of statins on CoQ10 levels. CoQ10 is important for mitochondrial function and mitochondrial density is high in brain tissue. An interesting study by Danish researchers was published in the very recent first issue of the 2013 Journal of the American College of Cardiology. The study addresses the effects of statin therapy on glucose metabolism, muscle function, and CoQ10. Twenty male subjects were recruited for the study. Ten were on treatment with the statin drug simvastatin due to high blood cholesterol and ten were healthy control subjects. The groups were matched for age, weight, body mass index, fat percent (total and abdominal) and maximal oxygen uptake. Fasting glucose and insulin measurements were done and a standard glucose tolerance test was performed. Muscle biopsies were taken for analyses of mitochondrial respiratory capacity of muscle cells. Insulin levels were similar in the groups under the glucose tolerance test, but glucose concentrations were higher in subjects on simvastatin, indicating impaired insulin sensitivity compared with the healthy controls. Q10 protein content in muscle was reduced in patients on simvastatin compared with controls. There were signs of impaired mitochondrial respiratory capacity in patients on simvastatin compared to controls. According to the authors of the study, impaired glucose tolerance found in simvastatin treated patients is in agreement with earlier findings of impaired insulin sensitivity with statin treatment, although a deleterious effect on glucose tolerance by simvastatin has not been reported before. Remember that last year, regulatory authorities warned against an increased risk of diabetes with statin therapy. The Danish scientists suggest that there may be a relationship between the decrease in Q10 protein content and reduced mitochondrial respiratory capacity among patients on long-term treatment with simvastatin. Possibly, muscle pain, impaired exercise tolerance and fatigue seen among some patients on statins may be traced to these mechanisms. Statins inhibit an enzyme called HMG-CoA reductase which is involved early in the pathway leading to cholesterol synthesis. Statins therefore also affect other products of this pathway, including the production of CoQ10. Statins have been shown to reduce blood levels of CoQ10. CoQ10 is important for cellular function and the generation of cellular energy by so-called mitochondria which are cellular organs that play a key role for many cells in the body. Nerve cells, heart muscle cells, and skeletal muscle cells are rich in mitochondria. Several diseases are caused by abnormal mitochondrial function. There is some evidence that statin myopathy may at least partly be related to low levels of Q10. However, it has not been proven yet that statin-induced myopathy may be successfully treated with Q10. 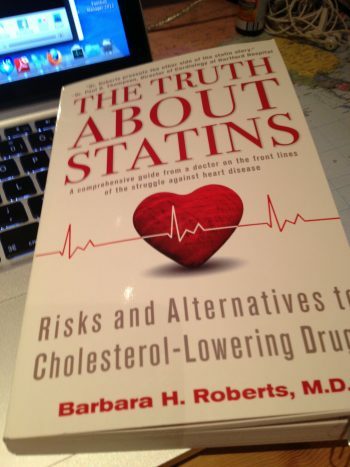 Doctor Barbara H. Roberts has written a book called “The Truth About Statins” that was released in April last year. Dr. Roberts is a cardiologist, associate clinical professor at the Alpert Medical School of Brown University as well as director of the Women’s Cardiac Center at the Miriam Hospital in Rhode Island. In her book, Dr. Roberts discusses the benefits and health risks of statin therapy in a very professional way. She discusses the role of cholesterol in the body and explains the role of cardiovascular risk factors. She explains the “cholesterol hypothesis” and the evidence supporting it. She cites clinical trials and explains in laymen terms how they are interpreted, underlining, for example, the difference between absolute and relative risk reduction. She thoroughly goes through the Yin and Yang of statin therapy. She also mentions the possibility that LDL-cholesterol may be less important as a risk factor among women than men, and that data showing that statins reduce risk appears less convincing for women. Dr. Roberts thoroughly goes through the Yin and Yang of statin therapy. She also mentions the possibility that LDL-cholesterol may be less important as a risk factor among women than men, and that data showing that statins reduce risk appears less convincing for women. Her discussion is objective, evidence-based, and she does not jump to any conclusions. Although she has a point to make, her writing is careful and unbiased. She finally presents a possible healthy lifestyle alternative to statin therapy, based on the Mediterranean diet concept. This is an honestly written book. Unlike so many medical authors today, Dr. Roberts does not to my knowledge have any product line designed to enrich her bank account. I recommend everyone interested in cardiovascular disease and modern-day health care to read Dr. Roberts’ book. It is a strong reminder of our real lack of knowledge of the long-term effects of drugs that are being prescribed to millions of people worldwide. I’m hoping you could think about an odd lipid profile I seem to have. I went LCHF about 18 months ago because of metabolic syndrome type things going on. I had blood work after about 6 months, which were HDL/TG/LDL_C 90/52/172. Now after a further 12 mos, I have 93/57/267. So the LDL-C has gone up a lot, and I can’t believe that the LDL-P will turn out low when I have it done (soon). I have been in/out ketosis, and sat fat is my friend. No other risk factors like BMI,smoking, family, etc. If it turns out I need to lower LDL-P, I can’t go much lower carb than almost none. Any thoughts? Secondly – which a better predictor of CVD: LDL-P or TG/HDL ratio? I’m great on one, and v.concerned about the other…. @ Bruce. It is well known that LDL-C goes up on LCHF, in particular if you increase the consumption of saturated fat. At the same time HDL-C usually goes up and TG may go down, both of which is positive. Nobody really knows how these changes will affect cardiovascular risk. We do believe that that the elevation of LDL-C is bad in terms of risk. However, whether this may be offset by the positive effects on HDL-C and TG is something we really don´t know. Although LDL-C is high, LDL-P does not necessarily have to be elevated (discordance). One of the proposed positive effects of LCHF on lipids is lowering of LDL-P and increase in LDL-particle size. If you want to lower your LDL-C you will probably have to decrease the saturated fats. Many cardiologists and lipidologists recommend statin therapy if LDL-C is above 190, because of the increased risk. LDL-P and TG/HDL ratio are both associated with cardiovascular risk. I don´t know of any studies comparing these two. Hopefully your LDL-P will turn out good. Thanks for the kind and accurate review of my book The Truth About Statins: Risks and Alternatives to Cholesterol-Lowering Drugs. Indeed, I have no product line I am promoting, only my expertise as a cardiologist for more than 35 years, and my knowledge derived from being involved in clinical trials of cholesterol-lowering medicines. I look forward to reading this blog. @ Dr. Roberts. I do think that you have written an important book. I deal with the question of statin therapy almost every day in my practice. These drugs have certainly given us the opportunity to affect the progression of cardiovascular disease and they have improved prognosis for many patients. However, the side-effects during long-term treatment have not been entirely clarified. Millions of people worldwide are taking statin drugs. Therefore it is so important for medical professionals and people in general to have knowledge about these drugs, both the positives and the negatives. The statin history and the “cholesterol hypothesis” is a complicated issue involving epidemiology, basic science, clinical trials, health politics, health economics, regulatory governments and the role of pharmaceutical companies. You did not choose the easiest mountain to climb. But you did very well. I will definitively recommend your book to my colleagues, coworkers, patients and…. Again, thank you for your kind words which are music to an author’s ears. I have taken some flak as you might imagine for criticizing the sacred calf of statin efficacy. Most people on statins still die of CVD, and I fear that for many, their quality of life is adversely affected. I fear we are just seeing the tip of the iceberg of neuropsych damage from long term statin use. This is an extraordinarily troubling and, I believe, misleading statement. I am not even considering questions about the accuracy of the “evidence” that you summarize – related to bias in manufacturer-sponsored studies, and to differences between “efficacy” in expert trials and “effectiveness” among real-world patients in community practice; even if we assume the “evidence” you cite is accurate, your statement must be challenged on two bases. First, any potential benefit cannot be considered without also considering potential harm. 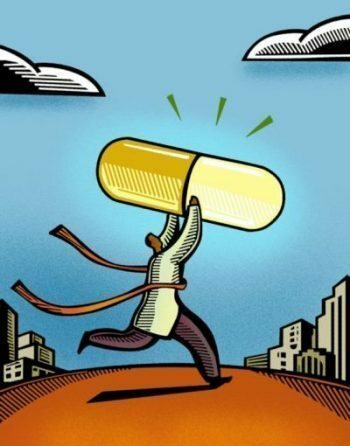 Let’s imagine a treatment which does decrease mortality from 4% to 2% (typically framed as a “50% decrease in mortality!”); does that automatically mean that treatment “is effective and … therefore, not giving … is bad clinical practice and goes against evidence based medicine … malpractice?” What if that same treatment produced intolerable side effects in half of those who take it, such that the trade-off would be significant morbidity in 50 individuals for every two whose lives are saved? What if 25 patients developed intractable pain, for example, and another 25 had severe cognitive dysfunction, such that they could not live independently? What if the “life saved” meant only one more year of relatively unpleasant survival? These are of course extreme examples, and I’m not suggesting that they apply to the use of statin medications for tertiary prevention. On the other hand, I raise them to point out the folly of pretending that something is automatically worth doing simply because it can produce a benefit in some patients … when one hasn’t even considered the concomitant harm that it can also produce. When we combine thinking about interventions in terms of NNT with an acknowledgment that potential harms must be considered alongside of potential benefits, very few of our treatments (at least outside of the context of acute care) appear as obviously desirable as they are often portrayed. Rather than talking about “bad clinical practice” or “malpractice” when a physician doesn’t automatically initiate some therapy simply because it has been shown to produce a benefit in some patients, we should actually start to think about making such judgments in the presence of failure to provide patients with adequate evidence, or to solicit patient desires about which of various possible approaches they wish to choose. Patients cannot engage in meaningful SDM without our help, but by 2013 we must embrace (not merely as a stand-alone idea that we never actually apply in clinical practice) the notion that we cannot ethically decide for them, in any case where competent and thoughtful patients, provided the same available evidence, might choose differently among different alternatives. It is fine to recognize that routine PSA testing, for example, or statins for primary prevention, are unproven (at best), and should not be forced upon patients. It is high time, however, that we also began to apply the same notions – about balancing potential harm and potential benefit, and about providing the information that patients need for truly shared decision-making – to the legion of other situations where there may indeed be proven benefits, but where there is also proven harm. Thank you Dr Hoffman for your comment, it is highly appreciated. I think you do have some valid arguments. Just a few words about the statement that you find troubling and misleading. I think it is important that we see both sides of the coin. In an article that evolves around the negative aspects of statin therapy, I felt I had an obligation to highlight the views of a large portion of the medical community, and emphasize the recommendations from the clinical guidelines. The guidelines are quite clear on the issue of statin use in patients with documented cardiovascular disease, or even high risk patients without known atherosclerotic disease. Most believe that the positive effects of therapy outweigh the risk. Furthermore, many specialist worry that statin drugs are not being used by many high risk patients who might benefit from them. I do not have a lock on the truth, I guess no one has. Therefore I think it is important for us to examine all the available data, not just those that reinforce our beliefs. I agree that the patient values and shared decision making is important. I have indeed reflected on that in another article. Helping patients to make a truly informed decision is certainly very important. However, our role as doctors is also to advise. I recall a study where compliance with prescribed/recommended therapy was associated with outcome. So, in addition to information, patients need guidance. I guess there are a few others. I am on day 4 of no sugar and carbs. I am so worried right now. I have 3 lovely children whom I homeschool and a wonderful husband. I guess my last day is really not in my control but I would like your oppinion on what you think about these numbers. I am feeling really bad about this. Thanks for the post Sandy. You have to look at the total risk profile which does not appear that bad in your case. I don´t know about your family history, but you don´t smoke, you are not obese, you don´t have any signs of the metabolic syndrome or diabetes and you exercise regularly. I guess blood pressure is normal. Your total cholesterol is a bit high and so is your LDL-cholesterol (calculated LDL-C 158). LDL-P is high as you point out. ApoB is not that bad. In low risk patient an ApoB less than 130 is considered acceptable. I can not give individual recommendations on my blog, that would be irresponsible. Therefore I definitely recommend you to follow your own doctor´s advise. However, I could tell you how I would react if I saw a woman with a similar clinical picture as yours, which I quite often do. Considering the absence of cardiovascular disease and risk factors such as smoking, high blood pressure, obesity and diabetes, I would not prescribe statin therapy to a 47 year old woman with a similar lipid profile as yours. I would admit that the lipids might imply an increased risk, and they should be a target for diet and lifestyle modification. You are right that sugar and carbohydrate restriction may positively affect LDL-P. However, there is no obesity, no indication of insulin resistance or the metabolic syndrome. Therefore I would consider it unnecessary to cut out all carbs, but I would emphasize choosing them wisely and definitely avoid products rich in refined sugars. Furthermore, choosing monounsaturated and polyunsaturated fats rather than saturated fats might help lowering LDL-C. In my mind a Mediterranean type diet would be a good option. Many studies indicate that such diets may reduce the risk or progression (Lyon Heart Study) of cardiovascular disease. Furthermore, there are studies suggesting that such diets may lower LDL-P. Omega-3 fatty acids may also help lowering LDL-P.
“A pessimist sees the difficulty in every opportunity; an optimist sees the opportunity in every difficulty”. My statin story…I started taking zocor/simvastatin in my early 40s (I’m 48 now) for high cholesterol as per my doctor. By the time I was 43, my brain had gotten to be what I described as “foggy”, and “spacey”. I couldn’t concentrate, couldn’t think straight or reason logically, and my memory had become absolutely terrible! When I thought of something I wanted to remember, I had to write it down within a minute or I’d forget what I was thinking about. I’m a software developer by profession, and I was having major difficulties performing my work, to the point where I thought I couldn’t do my job anymore! At that time, I had also been seeing an holistic doctor for my allergies for about 5 years, and I went to him for a treatment. While there, he asked me if I was taking any medications, and I told him about the simvastatin. He immediately suggested I consider getting off of it as there were studies indicating people taking statins were suffering symptoms related to memory loss and such. I told him I had been having those kinds of symptoms myself, and he printed me the article. I was shocked! Almost every brain-related symptom they listed as possible side effects of statin therapy applied to me. I talked to my primary care doc about a week later, and showed him the article, and told him I was going to stop taking the Zocor. About two months later, that “foggy” feeling started to diminish. It took over a year, but it did go away completely, and my brain felt normal again! Needless to say, I haven’t gone back to statins since, and never will, regardless of my cholesterol numbers! Very interesting summary. Thanks for putting this together.